1 – What drove you to pursue a career in manufacturing and how old were you? I was 23 years old when I began my career in manufacturing. As a youngster I always made and designed things – I would draw plans for house designs all the time. The first thing I built myself was a chess table, made from reclaimed wood and glass, with chess pieces that I fashioned from resin. I still have it to this day. I inherited the making gene from my father, who had been a prisoner of war and so he had, by necessity, developed a strong sense of make-do-and-mend. 2 – If you hadn’t embarked on a career in manufacturing, what do you think you would be doing now? I would be an architect. Building design is a passion of mine and I designed the extension to the Morgan Marine premises in 2015, as well as our most recent extension, which we will unveil this month. Because of the nature of our business, we were also able to fashion some of the building’s key features, like the staircase and handrails. This was particularly pleasing and It adds to the sense of pride in the building and in the company. 3 – What is your proudest career achievement so far? 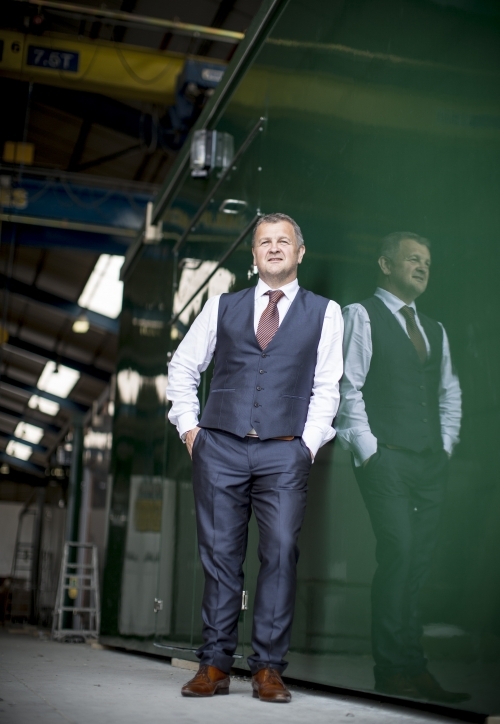 Gaining ownership of Morgan Marine and turning it around, from failure, to viability, to success – Morgan Marine is now approaching a £28 million turnover. Morgan Marine is completely embedded within the local community of Llandybie, which is a close-knit community, where local people don’t have enough local employment options. So I’m very proud to be able to offer stable employment, with good prospects and good working conditions, in my hometown, for, in some cases, several generations of the same families. Because of our location we do, in some ways, have to work harder and to offer more, since we are a long way away from our customers, but we make it work well. I am also proud to see the company develop into new and growing marketplaces. For example, I am very optimistic about the growth of the electric car market. If by 2040 we are all on track to be driving electric cars, then Morgan Marine is well placed to provide the necessary security enclosures and housings for electricity points and for the power generation sites that will be needed. 4 – What’s the best piece of advice you have ever been given? When I became MD the company was going through a long period of strife, it was in serious financial trouble and the bailiffs were at the door. Morgan Marine had a new MD every nine months or so and I was presented with the Managing Directorship as a fait accompli. I was a bit alarmed at the prospect, but our accountant pointed out to me that because I had started my career at Morgan Marine on the shop floor, before moving into stores, then into management, I had worked in each department in turn, so I was perfectly placed to fully understand how the business worked and where the weaknesses were. And it was important for me to use this experience to turn the business around. He also told me that the way you think determines how you act and the way you act determines how other people react to you. I have proved this to myself many times over the years and while it can be a difficult behavioural adjustment to integrate into your working life, it is very powerful. 5 – What’s one thing you have implemented in your business that you would encourage other manufacturers to embrace and implement? For the past five years or so we have held monthly Toolbox Talks, which have become invaluable to us, as a company. These are short sessions to which every member of staff, across all departments, is invited. We discuss the performance of the company, our forecasts and ambitions. But, more importantly, all colleagues are encouraged to talk very freely about any issues, and any suggestions they have to improve our processes. Many of the changes we have made in recent years, including to the layout of the factory, how we present our payslips and the design of our canteen have come out of Toolbox Talks. Of course, these sessions have an impact on time and operations and there’s little point holding these if you don’t listen and act upon them. But I learn something at each Toolbox Talk and I know the workforce feels a sense of buy-in because of them. 6 – How do you think the manufacturing community can collectively continue to engage and interest young people in manufacturing careers? We need to engage with young people as early as possible with the idea that making things is invaluable to society, personally enriching, and important. Everyone in manufacturing should take every opportunity to talk to the young people in their lives about what the job actually entails – to help dispel the common myths about manufacturing. We all need to be champions of our industry and enthusiastic ambassadors for it. 7 – If you were given 1 million pounds – how would you invest that in your business? In people, technology and training. In 2017 we invested around £1 million in an ERP system to integrate all of our functions across the company and this has involved extensive training for our management. Further technology – perhaps to increase automation – would require a large investment in further training. 8 – What is your view on post-Brexit Britain – positive, negative or indifferent and why? I feel strongly that Brexit provides Britain with great opportunities – both in opening up new markets and in allowing us to refashion our practices and regulations in a way that suits our particular circumstances in the UK. However, it is important that we recognise and celebrate the value of British industry and of ‘brand Britain.’ We have had a democratic vote and the Brexit process is going ahead – people of all political parties and persuasions must set aside their differences and work together to make this a success. 9 – Any wise words, advice or tips for someone looking to pursue a career in manufacturing? Firstly, challenge your pre-conceptions about manufacturing. Manufacturing is such a broad sector, encompassing so many different industries, each offering different opportunities and potential avenues – from textiles to electronics, from plastics to high tech. Do as much research as you can, think about what you excel at and pursue an apprenticeship with a reputable company that will give you meaningful training. Then – set your standards high and be tenacious. 10 – If you could choose, what would you like your legacy to be once you retire? To know that Morgan Marine has longevity and will continue to thrive and expand. I have always been very aware that the most important stakeholders in Morgan Marine are the general workforce – these are the people who rely upon Morgan Marine and its continued success to support their livelihoods and their families. 10 Questions With… is a regular feature where we put a variety of quick fire questions to manufacturing leaders and role models to get to know the people behind manufacturing success in the UK.